The third and final trailer for Star Wars: The Force Awakens premiered last night and thousands upon thousands of the Star Wars faithful began participating in their very own Celebrity Death Pool. Nobody was safe; rumors of the demise of Chewie, Han Solo, Luke Skywalker, and even our new heroes (which no doubt was a result of the #BoycottStarWarsVii dopes) flooded internet message boards. Even those who don’t think that Luke Skywalker is going to be struck down (and possibly become more powerful than anyone could imagine) have a morbid fascination with the Jedi Master turning heel. Some even think that Luke—in a J.J. Abrams mystery box conspiracy—is Kylo Ren, even though numerous set photos and interviews have confirmed that Adam Driver will be portraying the new villain. “That’s not true, that’s impossible,” exclaimed fans as they searched their feelings, knowing it not to be true. 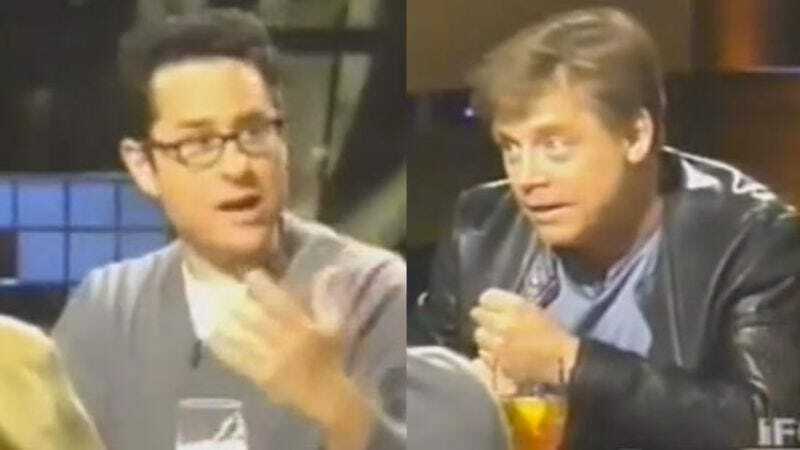 The episode also featured Kevin Smith, Stan Lee, Jason Lee, and none other than J.J. Abrams, who can be seen possibly spinning his wheels across from Hamill. This could be the moment where the seed of The Force Awakens was born. Unfortunately, even with Hamill, Smith, and Lee in the same room, there is no mention of Jaxxon, the big green rabbit from the Marvel Star Wars series. Maybe what we’re being told is true, from a certain point of view. Audiences will figure it all out on December 18, when The Force Awakens will be seen by those who managed to purchase advance tickets online.